I have a new idea for you! 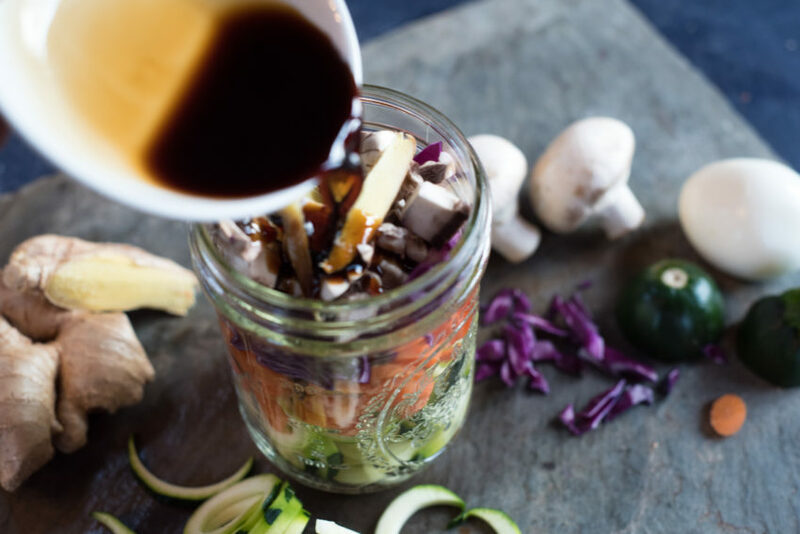 You know how those salad jars are addicting to make, because you can prep them in advance, fill them with a ton of great veggies and protein, and – let’s be honest – they look absolutely beautiful? Well, you can do the same thing to make a bowl of ramen! First, you’ve probably seen ramen bowls, because they are really trendy right now. 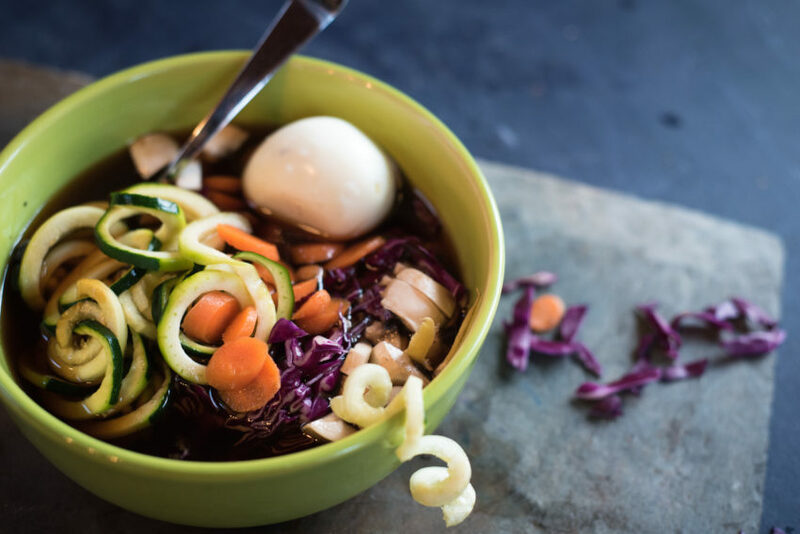 It’s a Japanese hot, flavorful broth, filled with vegetables and noodles. 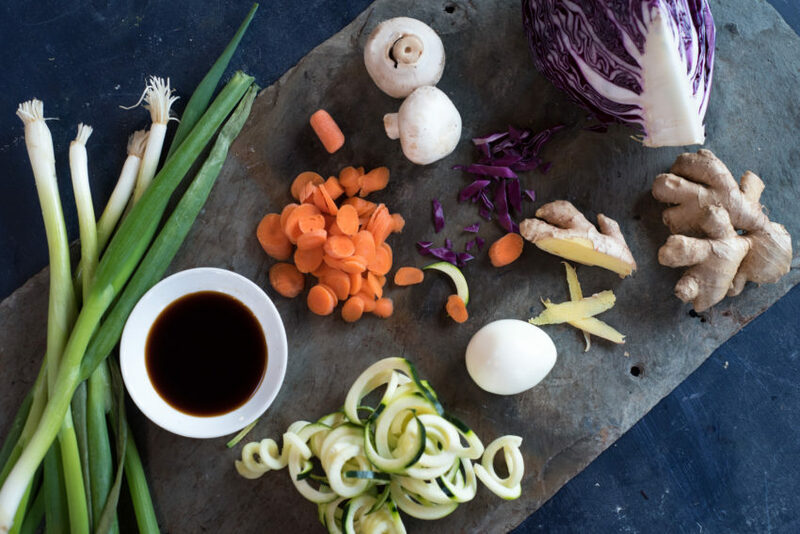 Well, I created a healthy spin using veggie noodles…those ones you can make either with a spiralizer, or with a vegetable peeler. 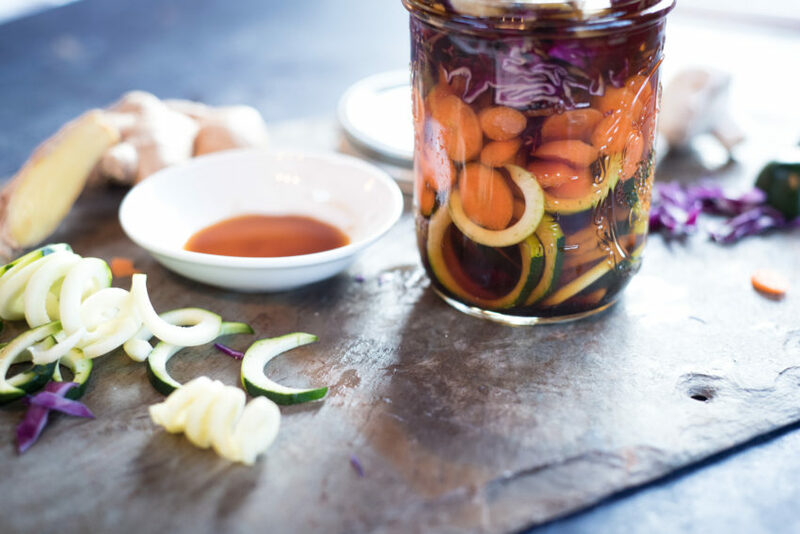 And you simply stack the ingredients into the jar to prep ahead. Or not. You can certainly eat it right away if you wish. No judgments here! Then, we’ll use some other veggies: thinly sliced red cabbage, sliced carrots, mushrooms, green onion (I LOVE the flavor of those), and a couple of slices of fresh ginger. Keep that hardboiled egg around…we will put him on top. 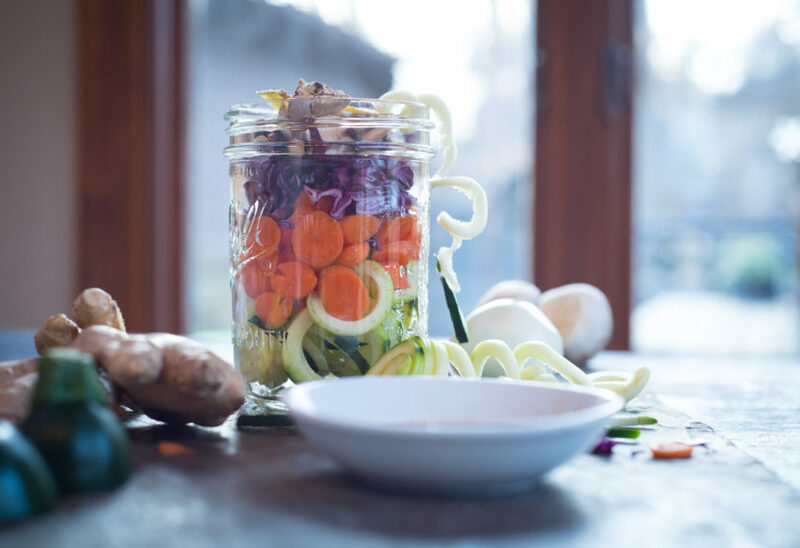 Pile those veggies into a glass jar: zucchini noodles first, then carrots, cabbage, green onion, mushrooms, and few slices of fresh ginger. Pour into a bowl, and….yum! It’s so flavorful, and so filling. Slice the egg if you wish, and remove the slice of ginger if you wish…it can be spicy to bite into. But your health will be better for it! By the way, this is the second recipe in a series of prepping hardboiled eggs for the week! You can get the first recipe – Avocado Deviled Eggs – right here. I created this recipe for Albertsons Safeway. If you make this – no, when you make this, please tag me in it! I would love to see and repost. Instagram, Twitter & Snap: @Annessa RD. Facebook: @AnnessaChumbleyRD. 1. 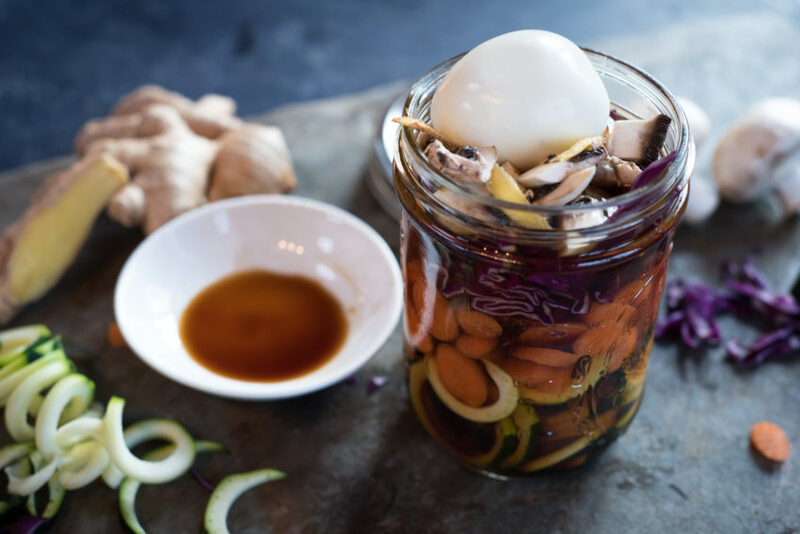 In a wide mouth pint jar, add zucchini, red cabbage, carrots, mushrooms, and scallion, pushing down gently to make room for the egg. Add ginger, liquid aminos (soy sauce) and egg. Seal with lid. 2. When ready to eat, heat beef broth to boiling. Add to jar and cover with lid. Let set about 4 minutes. Pour into a bowl and serve! 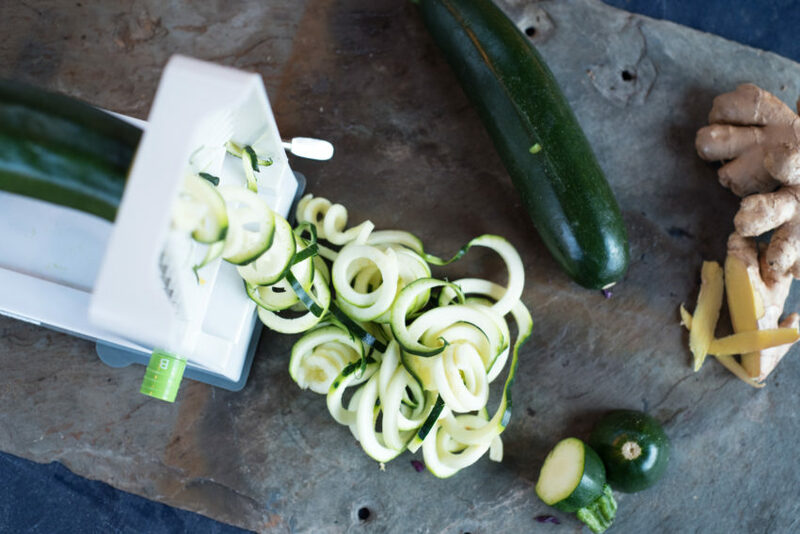 – If you don’t have a spiralizer, use a vegetable peeler to make the zucchini ribbons. – For a spicy version add a few drops of your favorite hot sauce! I made these today I added fresh garlic and drop of sesame oil for boost of flavor. So delicious!! !